The slices of beef carpaccio in this photo were sliced too thick. I was so eager to try it that I skipped the step where you freeze the meat before slicing it thinly. Wash the piece of meat under cool running water and then pat it very dry using paper towels. Then freeze the piece of meat until it is, at least, almost frozen through. Rub small pinches of salt and larger pinches of freshly cracked black pepper all over the outside of the frozen beef. Then heat 1 tablespoon of olive oil or vegetable oil in a small skillet over medium high heat. Very carefully, use long tongs to add the beef to the hot skillet. Be careful to avoid getting splattered with the hot oil. Sear all sides of the piece of beef, but do not allow the meat to cook through to the inside. You should spend no more than 4 minutes total searing the meat to allow the insides to remain rare. 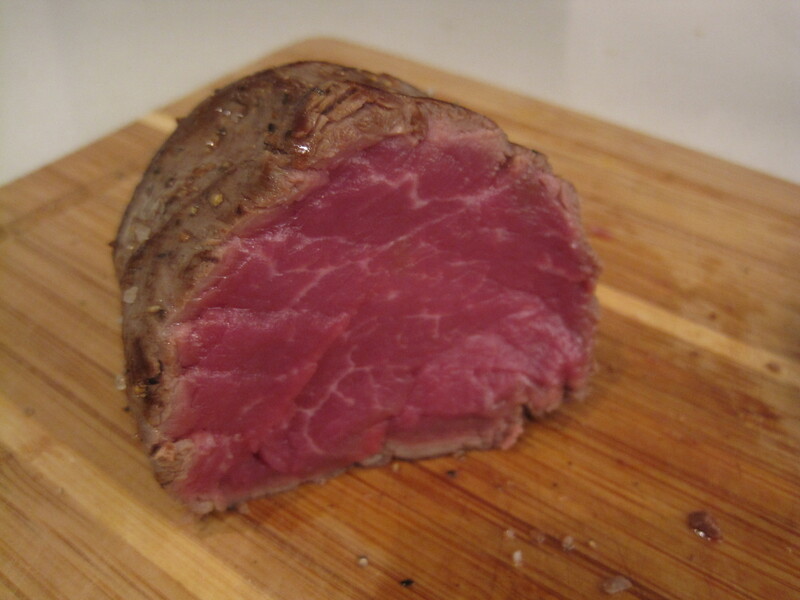 Then freeze the seared piece of meat for 2 hours to make it easier to slice the meat thinly. Using a large, sharp knife, slice the beef crosswise as thinly as possible. Place the slices of beef, one at a time, onto the serving plate, so that each piece slightly overlaps the piece that was put down before it. Arrange the slices of beef so that they form a large circle. 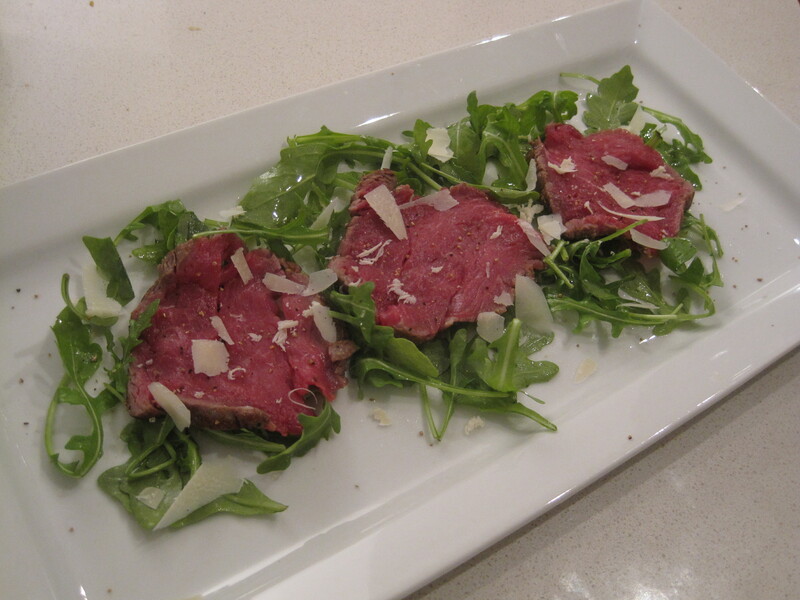 Then place the arugula onto the centre of the beef slices. Add a few squirts of lemon juice and a few light drizzles of extra virgin olive oil to the arugula. Top with some freshly cracked black pepper and shavings of parmesan cheese. Serve immediately. Using a rectangular serving plate, place the slices of beef, one at a time, onto one side of the serving plate, so that each piece slightly overlaps the piece that was put down before it. Arrange the slices of beef so that they form a circle over half of the plate. Then place a small mound of arugula on the other side of the plate. Add a few squirts of lemon juice and a few light drizzles of extra virgin olive oil to the arugula. Top the arugula with shavings of parmesan cheese. Add some freshly cracked black pepper to the entire dish and serve immediately. Mmm this sounds delicious. Beef Carpaccio is one of my boyfriends favorite dishes. I have always wanted to try to make it for him but I am not that great of a cook but this seems simple enough. I agree with you, the quality of the beef makes or breaks every dish, that is why I only use high quality organic beef. I can’t wait to give this recipe a try, thanks so much for sharing! Your boyfriend is a lucky guy 🙂 Please let me know how this works for you!